More than half a million journalists are working around the world, according to the International Federation of Journalists, and thousands of them are reporting and writing in English – specifically, American English – even though it is not their native language. 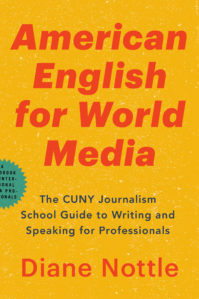 Now comes American English for World Media: The CUNY Journalism School Guide to Writing and Speaking for Professionals. Though produced by and for journalists, this new book will also help students and others in media and communications who need English to advance in their current jobs, publish beyond their homelands or work in international media. English is rapidly becoming the lingua franca of the 21st century, and international media professionals need to become both competent and comfortable in using it. But how? You may have studied it in school, but school English is not street English. And you may not have the opportunity to study at a professional school like CUNY’s. This book brings CUNY’s English-language coaching to you.  A guide to the professional jargon and forms you’ll need to use from day one of working with English-language media.  A review of the journalist’s No. 1 task: asking questions.  Tips on quoting accurately when interviewing in a language that is not your own (and may not be your source’s).  Advice on correcting and preventing the most common mistakes in writing and pronunciation.  A reader-friendly A-to-Z guide (searchable in the e-book) to English grammar and usage that not only lays down the rules but also explains the reasoning behind them. American English for World Media was written for the CUNY Journalism Press by Diane Nottle, coach to the international students at the City University of New York Graduate School of Journalism, where she founded and writes the English for Journalists blog. She is a former New York Times editor who has taught journalism and English in China, Poland and Canada. For more information, a review copy or desk copy, or advance classroom sales, please contact press@journalism.cuny.edu.